For many days, I have been conflicted about which pants from my past I miss the most - Bugle Boys, Z Cavariccis or "Hammer Pants." For the record, I have only owned Bugle Boys, but that doesn't mean I can't respect, and/or miss, Z Cavariccis and Hammer Pants. Curiously, I am not sure I know anyone who wore Hammer Pants, other than Hammer himself. Love the sentiment. Who needs a ride in the desert when you got the right pants? 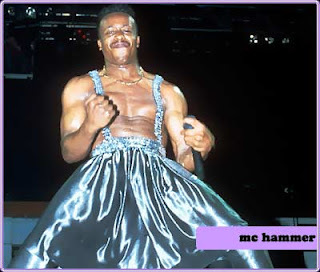 Still, something in me says I miss Hammer Pants the most. I also miss the phrase "Hammer Time," and for the immediate future, I plan on replacing "Hello" with "Hammer Time" when I answer the phone.